Are you participating in a BLOGtober Challenge? Perhaps you're taking part in the Ultimate Blog Challenge like me. If so, you might be looking for ideas. 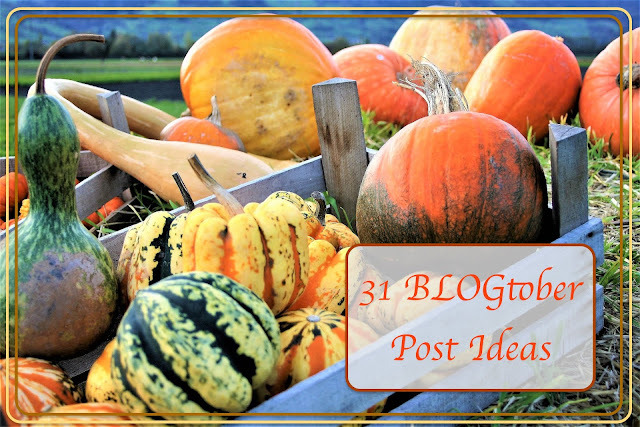 Here are 31 ideas you can use this fall or save for next year! 1. A fall dessert recipe - Either create a recipe of your own or review one you've been wanting to try. 2. A fall craft for kids - Create a tutorial for a children's craft. 3. A fall craft for anyone - Show your readers something you made and tell them how they can make it too! 5. Trick-or-Treat ideas - With Halloween at the end of the month, help your readers get ideas for trick-or-treaters. Check out this post. 6. Costume ideas - Give your readers an idea for a specific costume or generate a list of ideas. 7. Pumpkin carving idea - Give your readers some ideas! 8. Pumpkin Painting ideas - Give a tutorial or just display your work. Check out this post or this one. 9. Ways to save for Christmas with a savings timeline included - We all know the holidays can cost big time. Help your readers with a way to save money for the upcoming season. 10. Thanksgiving menu ideas - Give your readers ideas on delicious Thanksgiving fare so they can come up with a menu before the last minute. I have a post like this. 11. Your fall family traditions - Share your family's favorite fall traditions. 15. Fall Pinterest ideas - Make a list of things you want to do that you've found on Pinterest. 16. Fall Pinterest fails - This could be funny if you failed at one of your Pinterest attempts. 17. Fall recipe magazine review - Get a fall edition of a recipe magazine such as Taste of Home and review it. 18. Fall craft magazine review - Find the fall edition of your favorite craft magazine and let your readers know what you think. It might even be fun to find an old version from the 80s and do a review on that! 19. DIY fall-scented soap - I made some here, but you can make your own recipe and share it with your readers. 20. Quiz - How Much Do You Know About Pumpkins? - Generate a quiz for your readers. This can be a lot of fun! 21. Favorite Blog Resources - Give your readers ideas on where to get free pictures or anything else you might find useful. Share the love! Here's a post I did sharing free photo resources. 22. Fall Menu - Create either a menu of things you've eaten weekly this fall or generate a menu with ideas for your readers using recipes from your site. Here's an example. 23. 5 Ideas for Leftover Pumpkins - What are you readers going to do with their leftover pumpkins? Give them some ideas. 24. Review of your local apple orchard - I do this here. 25. Review of your local pumpkin patch - I do this here. 26. Quiz - How Much Do You Know About Halloween? - another great quiz idea. 27. Fall Favorites - Make a list of all your fall favorites from pumpkin spice lattes to cozy sweaters. 28. Reflection on the summer - Use this time to think about the great times you had. You might even want to create a photo album like I did here. 29. Recipe Roundup - take all your fall recipes and put them into one post. Here's one I did with pumpkins and one I did with apples. 30. Homemade Gift Calendar - Make a calendar so your readers can get ready for the upcoming holidays. We all know that handmade gifts take time. Give your readers a timeline they can fill in with a work schedule to help keep them on task with creating their homemade gifts. 31. Reflect on the season of fall - Check out my post here. I reflect on the blessing of autumn. So there you have it! Next BLOGtober you have no excuse! And in the meantime, use some of these ideas as the fall season comes to a close. Your readers will appreciate it I'm sure. Thank you! It could work for next year, yes! Thanks! And, yes, totally could tweak for Christmas and winter. No one should run out of ideas with this list. WOW what great ideas! I'm saving this list, for sure!